Five out of 15 Bengaluru Metropolitan Transport Corporation (BMTC) buses that the Regional Transport Office officials from the Transport Department had randomly inspected had failed the emission tests.That was in 2016. Recent reports said that BMTC bus breakdowns have considerably reduced compared to previous years due to an improvement in their maintenance procedures. Would that also mean that there is an improvement in BMTC buses following emission standards? What are the measures taken by BMTC to ensure that their buses follow emission norms? What are the external measures present to ensure that this happens? and cleaning of silencer many times every ten days. Regular and surprise inspections of maintenance work at the depots are conducted by officers from the zonal and central level. As per Transport Department’s rules, BMTC needs to check the emission levels of all its vehicles once in every six months. BMTC has 13 depots that have online testing centres distributed across zones, says Ganga Gowda (Chief Technical Officer, BMTC). The results from these tests are recorded in the server hosted by the Transport Department. A senior official with the Mechanical Department of BMTC said that in addition to the emission tests conducted every six months, buses are tested on a monthly basis at their respective depots. If the buses don’t clear the emission tests during either of the two testing processes, the vehicle is withdrawn and necessary maintenance work is performed. Ganga Gowda mentions that BMTC buses are regularly inspected for emission levels on route and in depots by BMTC personnel from the central office. If they are found to have violated emission norms, the information is provided to the Depot Manager to take requisite action. BMTC has been moving towards increasing its number of Bharat Stage IV (BS4) buses. In the past two years, over 1400 buses have been added to the fleet and over 1100 buses have been discarded. As per data provided by BMTC, they currently have 3420 buses under BS 4 norms, 3064 under BS 3 norms, 143 under BS 2 norms, while there are no buses under BS 1 norm. BMTC is also in the process of introducing 80 Electric buses in Bengaluru. All these are aimed at fuel efficiency, green fuel and reducing emission among BMTC buses. RTO officials are mandated to randomly check vehicles for Pollution Under Control (PUC) certificate. They are also assisted by Karnataka State Pollution Control Board (KSPCB) in inspecting the emission levels of vehicles through KSPCB’s mobile emission testing centres (12 in Karnataka, and six in Bengaluru). The Transport Department checks the calibration of BMTC’s online emission testing software randomly and once in every three years during the renewal of the centre’s license, says their Public Relations Officer (PRO). The KSPCB receives monthly reports that include details and results of the monthly emission tests conducted. The KSPCB issues notices to BMTC in instances where there are several violations of emission norms, says KSPCB Chairman Lakshman. The BMTC had introduced a system where citizens can report observed instances of high bus emissions levels either online or through their helpline, and be rewarded with Rs 1000 after inspection and if the levels were above the norm. The reward system currently doesn’t exist but the complaint mechanism is still present. While the Transport Department has the data of emission results of BMTC buses on its server, there is no monitoring mechanism in place to ensure that notices are issued to BMTC when buses don’t meet the emission norms, or when certain buses regularly fail emission tests; and that they report back to the Transport Department. 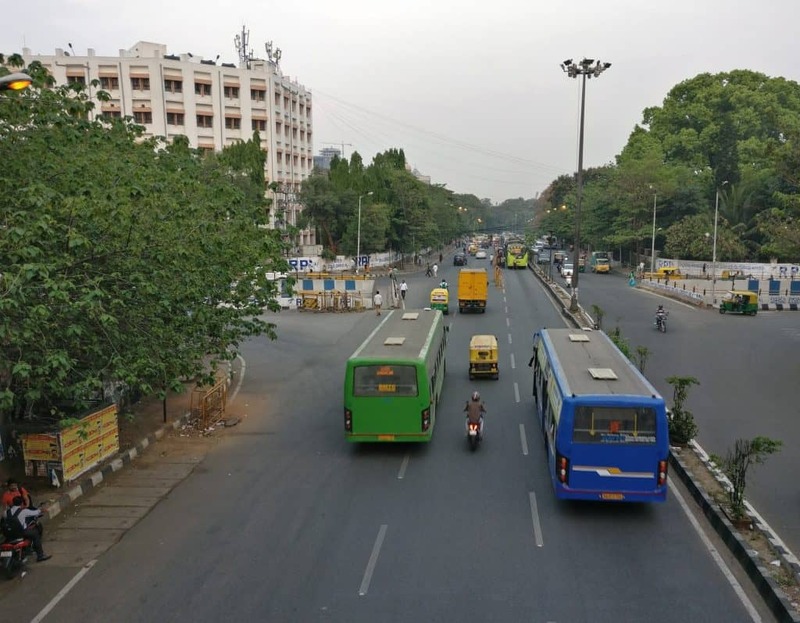 A spokesperson of the Transport Department said that the only way they check if BMTC buses are following emission norms is through random inspection of PUC certificates and physical testing of emission levels. BMTC has a feedback system that encourages citizens to report and provide feedback to BMTC when they observe heavy emissions. This is an essential form of external monitoring. However, several of the commuters and other passengers that Citizen Matters spoke to weren’t aware of the existing systems to provide feedback on BMTC services. Whether it is 500K, 500C or 500D, you’ll know only when the bus is close by and it won’t stop unless you signal the driver. This means you flag down every bus to look at its number and then wave the angry driver along.